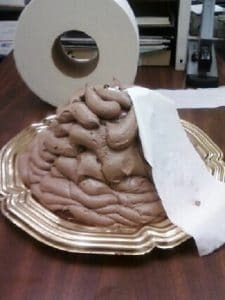 Postal employees not amused when a USPS Station Manager made employees a Poop Cake for a poor Mystery Shop. Understaffing led to the low Mystery Shop Score. LEE COUNTY: Workers at the Cape Coral Post Office say their manager baked them a dessert that looked like something you’d find in a toilet. The attempt at bathroom humor backfired in a big way.Workers at the Cape Coral Post Office were not amused by the cake crafted by the post office manager. The manager made the cake to look like poop because the office received a bad score from a mystery shopper. “Yup, we had a poopy day,” said Lucille Sacco. Employees were angry about the cake. “I thought it was appalling. I thought it was degrading to the employees and I just couldn’t believe it,” said Sam Wood, Southwest Florida President of American Postal Workers Union. On the day the mystery shopper was at the office, the line was out the door. Because the mystery shopper had to wait more than 25 minutes, their score automatically dropped to 75. They were understaffed, but no matter how long the line, the US Postal Service requires workers to ask a list of questions to every customer. “If they miss one, they get marked off for not asking those questions,” said Wood. Sacco says clerks are forced to provide the best customer service, as quickly as they can. “Ask the questions, service the customer and get them out. Get them out, get them out, get them out. And all it is, is percentages and a number. And we’re just another number,” said Sacco. The office’s final score was 48. The poop cake representing the “poopy day” backfired. The US Postal Service released a statement about the incident. While it was intended to lighten the mood, it did just the opposite. “I have never seen anything like that. And I don’t think it’s funny,” said Sacco. This entry was posted in Clerk Business, General Union Business and tagged Cape Coral Post Office, degrading, dignity and respect, harassment, mismanagement, Mystery Shopper, poop cake, Sam Wood, Throwback Thursday, understaffed. Bookmark the permalink.